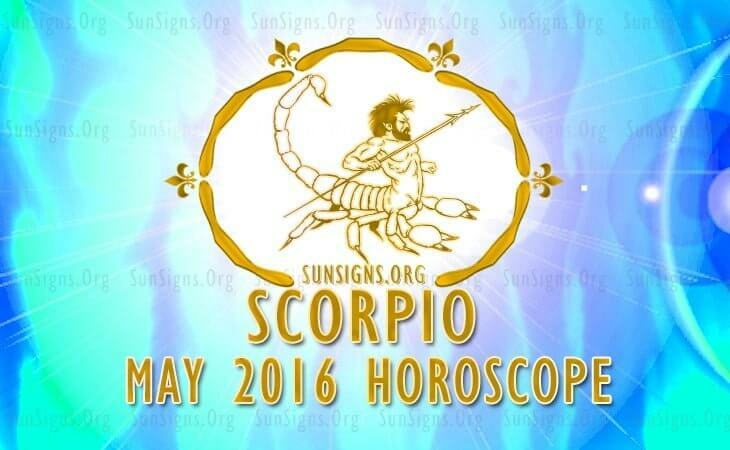 Scorpio May 2016 Horoscope foretells that your social skills are very powerful this month. This is not the time to assert yourself. You will need to be open and adapt to people’s feelings. Success comes from others and you have to be flexible to situations. Personal ambitions will be on the back burner. In May 2016, the Scorpios will have to focus on important things and relax from doing unnecessary things. Your personal behavior and image are in for a change. Your sense of dressing will become ore fashionable. Scorpio zodiac sign people following their academic careers will have to make long term modifications. You have to review your educational plans and make necessary adjustments. Your interests may vary and you may switch over to new fields of education. The Scorpio 2016 May monthly forecasts suggest that this is the time to use your professional skills to overcome the challenges in career. You can use your creativity to convey your ideas and get the support of your business associates. You should use your communication skills to motivate others at the work place during this 2016 Mercury retrograde. Monetary situation will be magnificent during May 2016 for the Scorpions. You will save money gradually and with the solid support of your family members and through your profession. All major purchases, investments and contracts require proper examination. Various aspects of your family interests and personal goals may be at loggerheads from time to time and you have to overcome these obstacles to progress financially. Romantic opportunities for forming new alliances or enhancing the present relations will be available. Existing Scorpio relationships should be scrutinized and decisions should be taken regarding the fate of those relationships. Things will become clear after the 19th. You may find love with the help of a close friend or while dating online. Married couples may have problems balancing their career with love aspirations. Love with your spouse can be boosted by Scorpio sexual intimacy and decision to have children in May 2016. Scorpios will be energetic and be blessed with good health this month. This is only due to your effort in sticking to regular exercise routines and daily meditation. The Scorpio May 2016 astrology predictions foretell of a month when you need to be calm and adaptable to other’s ideas before coming to your final decisions.